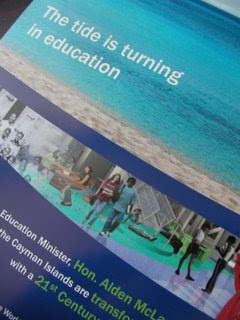 I continue to be amazed really that there is so much interest in the education transformation process under way in the tiny country of the Cayman Islands. It is the holistic approach to total transformation that is most interesting to many. I written about it before but the Hon. Minister, accompanied by a small team of us to act as a panel, go to 'Moving Young Minds' (World Ministers seminar on technology in education) in London where he will address potentially dozens of other Ministers about our vision and progress towards achieving it. One hour of the session is Q and A's to the panel for which I have been trying to prepare. Spending the day preparing presentation slides for unknown but anticipated questions from Ministers is quite challenging - the first time I have prepared work for this size audience of this calibre or status. We're trying to be really professional and have slides/images for almost every possible question allowing for technical questions, but not too technical, detail but not complex and so on. It doesn't matter if we don't have the slide - we have the people to answer the questions - it's just a matter of preferred style really. I'm just wondering really how many really obvious ones we'll miss! This massive international focus on Cayman is AMAZING and I am delighted to have been an integral part of the process from the very start. A unique opportunity in the education world.